The awareness of sustainability is an increasingly visible aspect in strategic and business planning although its interpretation seems to vary quite widely. Many organizations are today trying to balance the triple bottom lines of economic, environmental and societal outcomes or, their analogs, “people, planet & profit”. Most have embraced stakeholder expectations alongside their profitability goals; especially when environmental. Others are dealing with overarching industry-specific sustainability dimensions such as governance, safety, animal health, transparency, source traceability, noise or net-zero. Sustainability experts might argue that all these industry-specific concerns fit into one of the big three dimensions but to industry insiders they often represent dimensions all of their own. It is advisable to consider sustainability’s changing landscape itself when planning for the very long term. A decade or more ago many business people felt measuring corporate performance in terms of carbon emissions to be the pastime of a lunatic fringe. How do their long term plans look today? 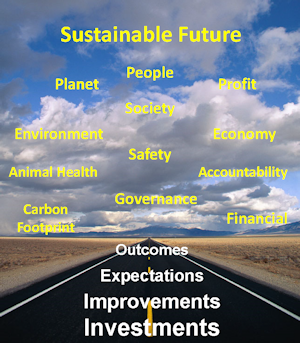 In some businesses long term planners need to be looking at emerging environmental concerns such as Indoor Air Quality or RF Radiation footprint, changing corporate social responsibility expectations, strengthening transparency & accountability requirements, the natural evolution of governance models during growth stages, and increasing expectations for self-sufficient financing. a new strategic direction or pillar? or a way of life? When helping clients design their sustainability strategies we start with their clarified definition of ‘sustainability’. Then lay out their goals as a series of specific objectives that reveal many different points-of-view. This moves beyond social, environmental and economic outcomes and reveals how stakeholder and customer expectations, product & process improvements, and capability investments lead collectively towards desired sustainability goals.